For the past twenty years or so, my aunt and uncle have hosted Thanksgiving as an annual family reunion. Two dozen (or more) of us descend on their house from all over the country, starting our celebration on Wednesday evening and keeping it going straight through the weekend. Since New York can be cold in November, I wore one of my warmest hats to Thanksgiving dinner last year – and my aunt admired it to the point of putting it on her own head and running off to look at herself in the mirror. I asked her (not too subtly) what colour her winter coat was, and then sent her this hat as a surprise bit of thanksgiving. 16” circular needle (optional, but recommended) and a set of five double-point needles, size US 6 (4mm) or the size needed to get gauge for your particular yarn, a stitch marker for the beginning of the round, plus a darning needle to weave in ends. Stitch markers to indicate each section of the hat can be helpful. The hat is knit with two contrasting colours of worsted weight yarn, plus a small amount of sport weight yarn if you wish to include a facing. 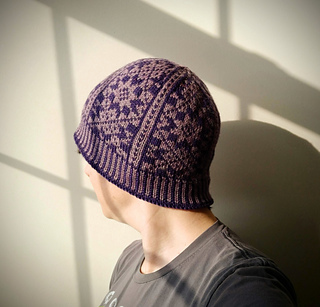 The sample hat was made in the smaller size in Cascade 220 in shades of light and dark purple, using approximately half a skein of each colour, and the facing with approximately 70 yards of Cascade 220 Sport Superwash in beet red, all on US 6 (4mm) needles at 23 stitches to 4”, and fits a 21.5” head with a little bit of ease. The pattern includes charts for two sizes. Use the chart that will give you the right-size hat based on your needles, yarn, and gauge. This hat has an optional facing, which is knit in a lighter-weight yarn on the same size needles. Omitting the facing will result in a looser hat.